Teresa Texeira, a patron of Hamura's Saimin Stand for 40 years, samples the special. It's now official. Hamura's Saimin Stand on Kauai is a classic. The James Beard Foundation will honor the iconic restaurant in the America's Classics segment of its prestigious awards show on May 8 in New York City. Hamura's will be one of eight eateries around the country honored for excellence and "preserving America's culinary heritage and diversity" at what many consider the Academy Awards for chefs. 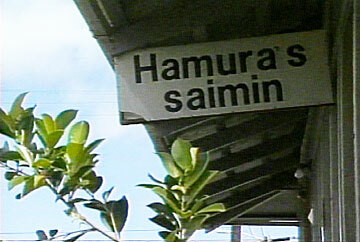 Hamura's saimin has been a Lihue mainstay since 1951. When asked if he knew that Hamura's Saimin Stand would receive this national recognition, Nick Barcial, a fourth-generation owner stirring batter and beating egg whites for Hamura's famous lilikoi chiffon pie, shrugged and smiled. He had heard something about it, he said, and knew foundation representatives had called repeatedly. But everyone had been too busy to talk with them. "Any type of award, we're surprised," said the 27-year-old Barcial, who makes 50 chiffon pies a day and still can't keep up with demand. "We're just a small operation; we don't do anything too fancy." Even when the foundation offered a free round-trip ticket to New York -- something it never gives honorees -- Barcial said he wasn't sure if anyone from the family would be able to go to the event, where a publicity blitz would likely follow a standing ovation from 1,600 top chefs. "We're kind of busy and kind of short-staffed," he said. At almost any time of day, every wooden stool is occupied at the U-shaped Formica countertops. Local residents line up against the back wall next to tourists clutching the guidebook that directed them to the nondescript eatery. Others mill around outside under the restaurant sign where the "S" has been missing for several years. Nobody minds waiting, though. The service is fast, and as people come and go, patrons gladly shift seats to make room for new diners. Teresa Texeira orders her saimin before she sits down. As she mixes hot mustard with shoyu in a small saucer, a friendly shout comes from the open kitchen: "What's going on? Texeira doesn't want her usual?" 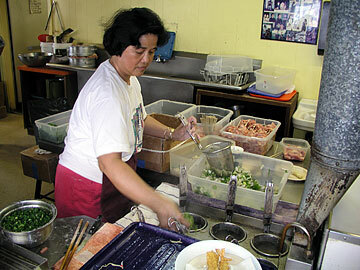 Estela Caoagas, has prepared saimin at Hamura's for more than 20 years. She explains that she's hungry and wants more vegetables and meat with her noodles. If there were a menu, Texeira wouldn't need to look at it. She has dined at Hamura's an average of three times per week for the last 40 years. "It's an addiction," said Texeira, sprinkling a vinegar and chili pepper blend onto her chicken kabob. "I gotta get my saimin." "They treat you nice," she added. "If you're in a place where you're treated good, you're going to come back." TAKEOUT IS another popular option. Rental car agents on Kauai know all about Hamura's and direct throngs of visitors there each day. The manapua may sell out by lunchtime. And businessmen who fly over for the day often pick up the freshly made noodles for family and clients back on Oahu. Hamura's employees start concocting the noodles at 3 a.m. in the family's factory. "It's a nice chewy noodle and doesn't get soggy in the broth; it's al dente," said gourmet cook and food writer Joan Namkoong. Secret ingredients comprise a special broth developed in 1951, when Aiko Hamura, the family matriarch, started the business. Fourth-generation Hamura's Saimin owner Nick Barcial prepares lilikoi chiffon pies. Estela Caoagas fills "hundreds and hundreds" of saimin bowls each day and has cooked for 12 hours at a stretch in a steaming kitchen for the past 20 years. Neat piles of fish cakes, green onions, hard-boiled eggs and sliced ham wait be to tossed into the broth and noodles. Caoagas pleasantly, but firmly, dismisses inquiries about a notorious local ingredient: "We don't use Spam." "Wholesome food at competitive prices" is the key to Hamura's success, Barcial said. It's popular with visitors because "they want to eat what the locals eat." Michigan resident Leslie Michalik agreed. "It's kind of a little cultural experience," she said, while finishing her third lunch of the week at Hamura's. "Good food is not exclusive to fine dining," said James Beard spokesperson Melanie Young, who would not confirm any awards before the ceremony. A committee of educators and journalists select winners in the America's Classics category -- often small, family-owned restaurants "beloved in their communities for their food and ambiance." Helena's Hawaiian Foods in Kalihi was recognized in 2000 and Sam Choy's Kaloko in Kailua-Kona in 2004. Hamura's is nothing short of beloved, with or without awards. Barcial's mother Wendy is now too ill to run the restaurant, but her dedication to the business has inspired Nick, who started sweeping the floor when he was 8, to help maintain the tradition. "I have a little daughter," Barcial said, "so she's going to be working here soon."